Okra is one of my favorite vegetables. Growing up in the UK, it was a regular on my family’s dinner menu rotation. We’d eat it crisped, stuffed with spices and fried, or cooked in a tangy tomato curry. It was always finger-licking good. When we’d travel back to India, the extended family would be alerted of my love of this magical vegetable and an okra dish would appear at every dinner party we attended. Delicious! When I moved to the US however, I was shocked to learn that okra is not just unpopular, it’s actually one of the most reviled vegetables out there. As it turns out, cooking okra the way Americans often do, in a Gumbo, releases a gooey substance that makes for an unpleasant slimy texture. So much so, that okra is often referred to as “the slime vegetable”. As you can imagine, this nearly broke my okra loving heart. This slimy vegetable sounded nothing like the tangy, spicy, crispy vegetable of my youth. If you’re stewing, boiling or steaming your okra and then complaining when it turns out gooey, here’s an idea: try cooking it differently! (I can’t help but draw a parallel here with the poor Brussels sprout). 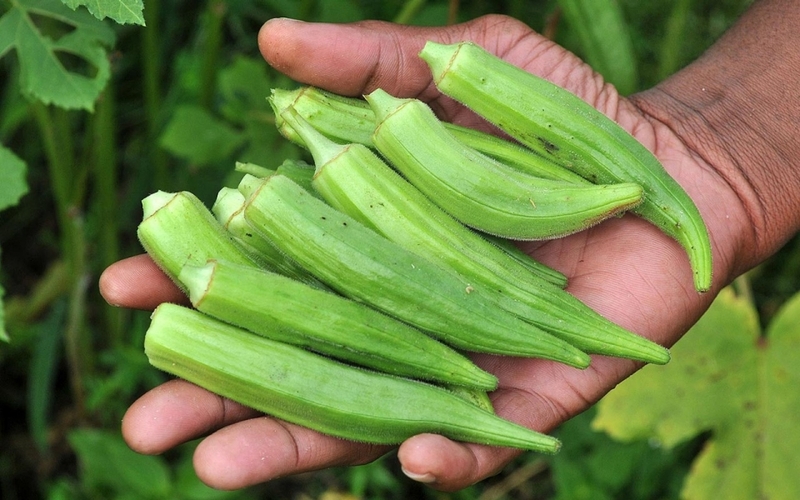 1) Okra is loaded with vitamins and minerals. One cup of okra contains 60% of your RDA of vitamin K, which is essential for proper blood coagulation and helps with bone strength and cardiovascular health. It’s also rich in folate (crucial in preventing birth defects), Potassium (used to build muscle and break carbs down) and Magnesium (essential for protein synthesis and muscle function). Okra can even hold its own against the mighty Brussels sprout. One cup of okra contains only 30 calories. 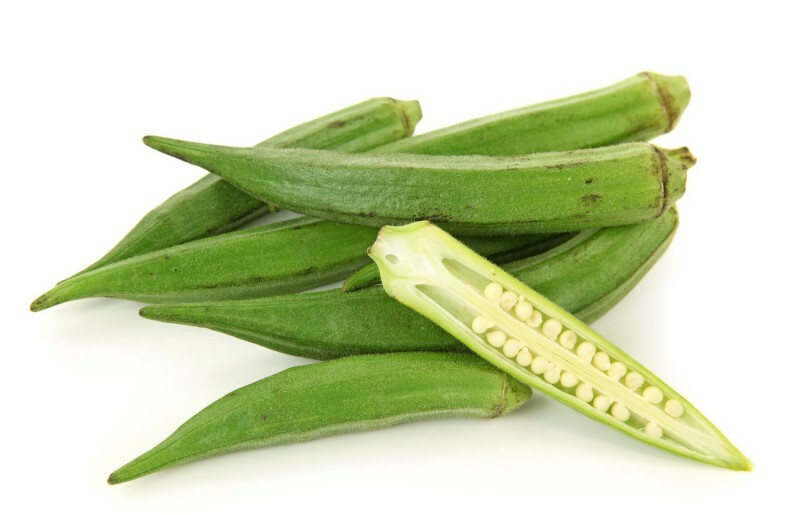 As a fellow blogger puts it, why snack on not-nutritionally dense celery and iceberg lettuce for a low-calorie veggie when you can munch on a nutritionally-dense, low-calorie veggie like okra? Nuff said. Okra is rich in fiber, which is essential for digestive health and keeps you feeling full longer. Perhaps most importantly, soluble fiber from fruits and vegetables helps lower blood cholesterol and reduce risk of heart disease. 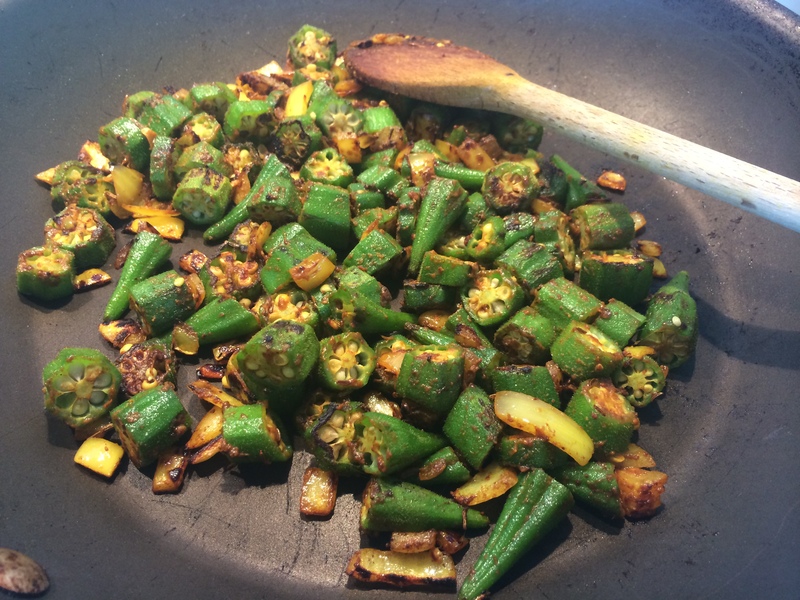 The dish we’re going to make is known in India as “bhindi bhunjia” (literally, crisped okra) and is my go-to recipe for okra, because it’s quick, easy and has a wonderful tangy kick and a crunch to it. It’s also entirely devoid of slime. Serving the finished okra with some lemon juice and a side of lime pickle really takes this dish up a notch, so if you don’t already own any, I’d recommend buying a jar of Indian pickle and sticking it in the fridge (it lasts forever). If this is your first time cooking with turmeric, one thing to keep in mind is that the darn thing manages to stain just about anything. Be prepared: no white shirts, no white countertops, no white fridges, no white iPhones. Wash your hands thoroughly after handling and, if a spot of turmeric (or okra cooked in turmeric) does get onto your pristine countertop, squirt some dishwashing liquid onto it and let it soak a few minutes before scrubbing. Wash the uncut okra and lay flat on a paper towel. Pat the okra dry. Note** do not slice the okra while it’s wet. More importantly, do not wash the okra once it’s been cut — this is crucial if you are to get crisp texture rather than a soggy one. 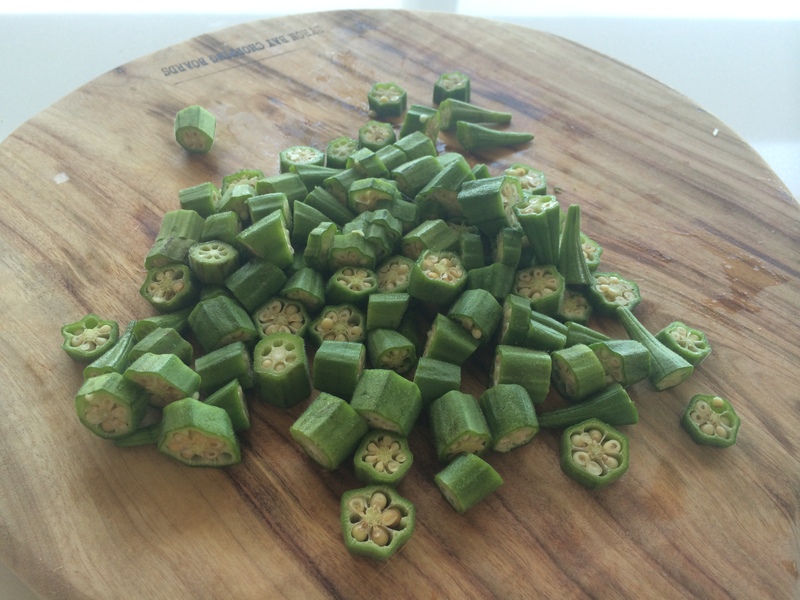 Slice the tops off the okra and cut the rest of it width-wise into thin, even, slices. The more finely you slice it, the more crispy it’ll be. I cut mine about 0.5cm thick. Coarsely chop half a white onion. 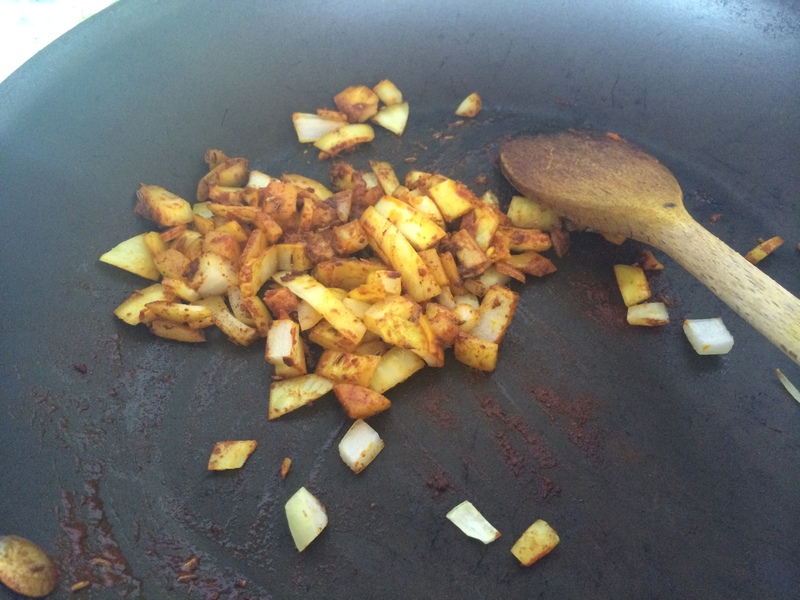 Add the mustard oil to a frying pan and heat over medium. Once the oil is hot, add the garlic paste, the turmeric, cumin seeds and chili powder and cook for around 1 minute, using your wooden spoon to ensure the spices are evenly mixed with the oil. Add the chopped onion, coat and cook for a minute. Finally throw in the okra, turn up the heat and mix well. Sauté for a few minutes, stirring constantly. If you don’t want your okra super crispy, turn the heat down, cover the pan and cook for about 5 minutes with the lid on. Otherwise, leave the frying pan uncovered and sauté the okra and onion as you would any other vegetable — stirring and shaking on medium-high heat. You should see the okra and onions starting to brown. Add 1/2 a teaspoon of salt and cook until you have just a touch of charring and a good coat of golden brown spices. Finally, remove the okra from the heat and squeeze a bit of fresh lemon over it before serving. 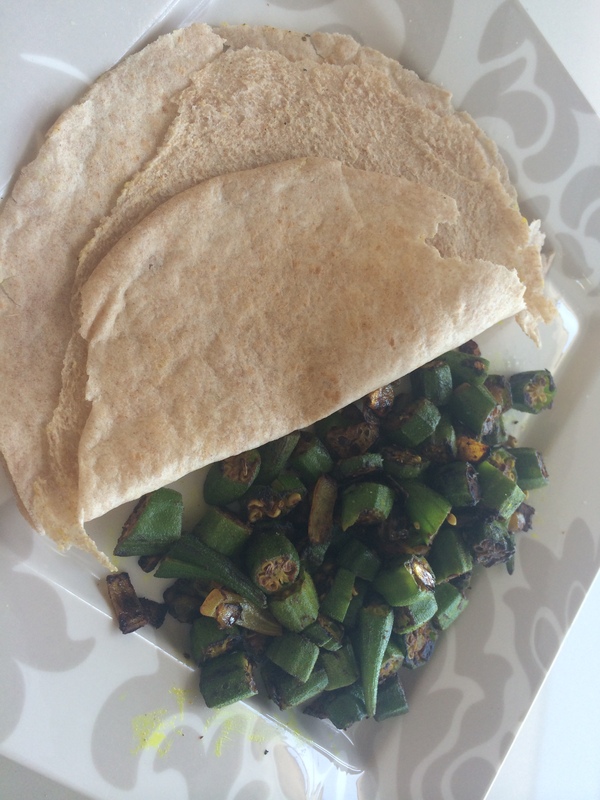 Eat with Indian lime pickle (the tangy citrus really complements the flavor of the okra) and some roti. Enjoy! The cauliflower, like the Brussels sprout, is a much maligned vegetable — the texture is weirdly rigid yet crumbly, the color is boring, the taste is bland and the smell, oh don’t even get me started! Actually, I’m pro cauliflower, but I can relate to people who aren’t. After all, many of us grew up with steamed or, worse still, boiled cauliflower plopped onto our plates next to mushy peas and carrots at the school cafeteria. It’s hard to shake these early experiences and it’s entirely possible that your distaste for the humble cauliflower is rooted in trauma. Time to let it go. 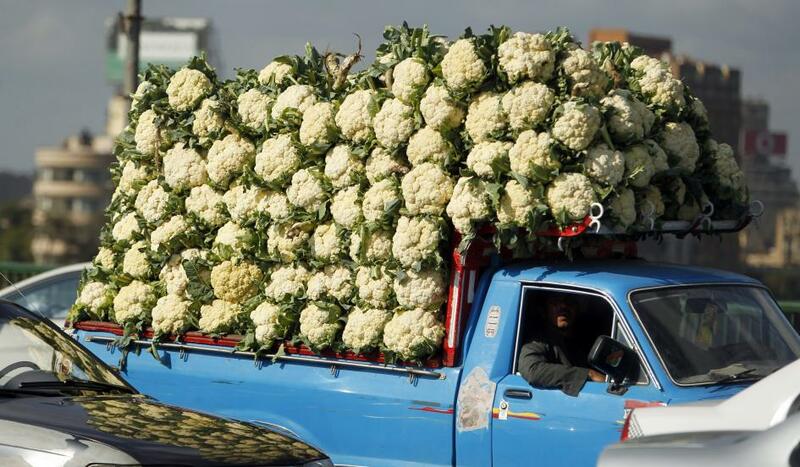 Because…cauliflower is awesome. Cauliflower may not exude the rustic charm of the heirloom carrot, the accessibility of broccoli or the trendiness of kale, but when it comes to nutritional content, it’s a winner. In fact, this veg is a veritable powerhouse of vitamins and minerals and it’s finally starting to see some of the recognition it deserves, with reports of it being the next superfood and of 2014 being “the year of the cauliflower”. It’s also popping up on gourmet restaurant menus across the US. What’s so good about it? For starters, it’s part of the cruciferous family of vegetables, which includes broccoli, kale, bok choy, cabbage, kohlrabi, daikon and yes, Brussels sprouts. Cruciferous vegetables contain glucosinolates, which are responsible for their distinct pungent aroma, but also break down to form active compounds like nitriles and indoles, which are purported to have anti-cancer properties. Like other cruciferous vegetables, cauliflower is also rich in sulforaphane, a sulfur compound that is credited with benefits ranging from improved blood pressure and kidney function, to detoxification and aiding with digestive health. Sulforaphane has also been linked to a reduction in cancer stem cells and tumor growth. Cauliflower is also loaded with minerals and vitamins — including vitamin C, vitamin K, beta-carotene and other anti-oxidants and anti-inflammatory nutrients, which can help reduce the likelihood of diseases like arthritis and diabetes. Finally, cauliflower is low in calories and packed with fiber, an added benefit if you’re trying to lose weight. If you’re interested in learning more, two great roundups here and here. Armed with that knowledge, let’s dive into our cauliflower recipe for the day! 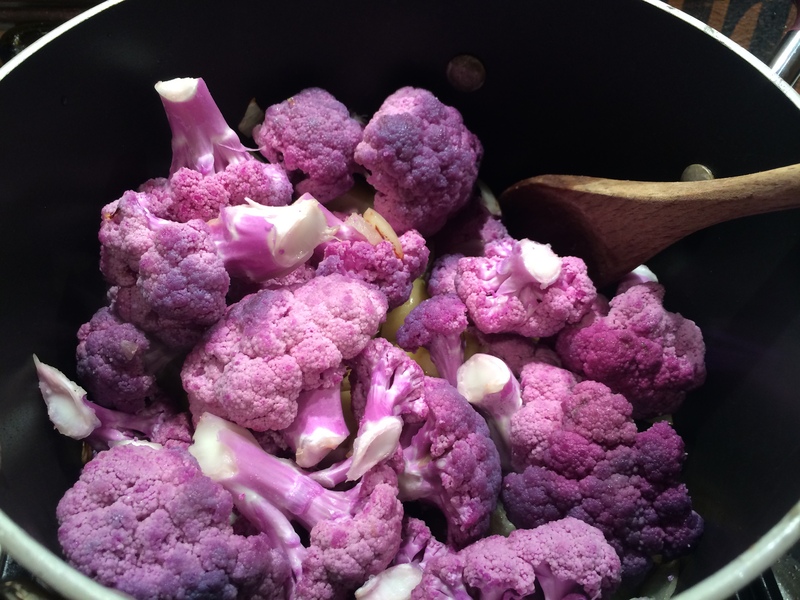 When it comes to veggies, nothing beats the color purple. Typically, the purple hue in fruit and veg is accounted for by anthocyanins which, you guessed it, are loaded with antioxidants and flavonoids like resveratrol. 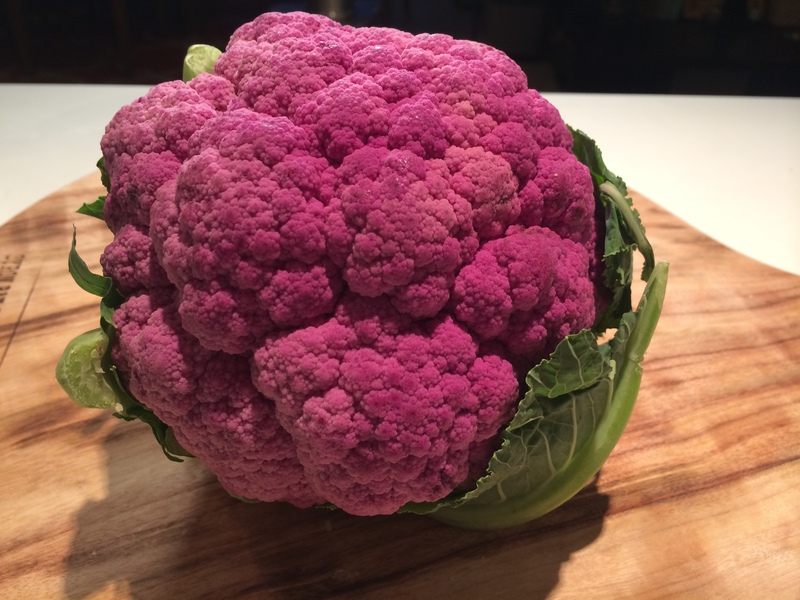 Naturally, when I came across this beautiful purple cauliflower at the Bondi Road Fruitologist last night, I had to have it! 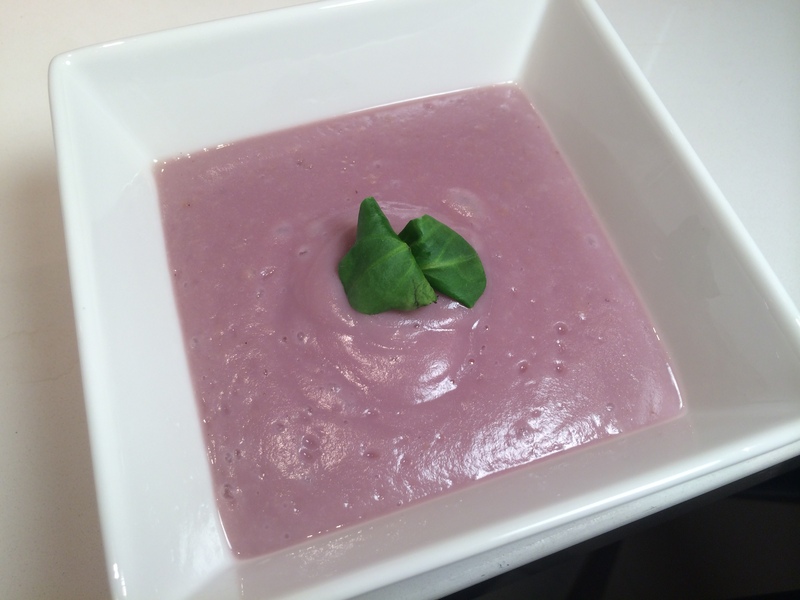 This soup is creamy, vegan and absolutely delicious. You can eat it hot or cold, in summer or winter and it’ll wow your dinner party guests and charm your kids alike. Let’s go! Prep your veggies: peel and chop the onion, wash and quarter the potatoes, rinse and break the cauliflower down into smaller florets. Heat some olive oil in a pot and sweat the onions and garlic until they’re translucent. Don’t let them brown. Once they’re ready, add the cauliflower florets and diced potato. Cook down for 5 minutes, stirring constantly. (My cauliflower florets turned a cool neon blue at this point!) Now add the water or veggie stock until the cauliflower is 2/3 of the way submerged. 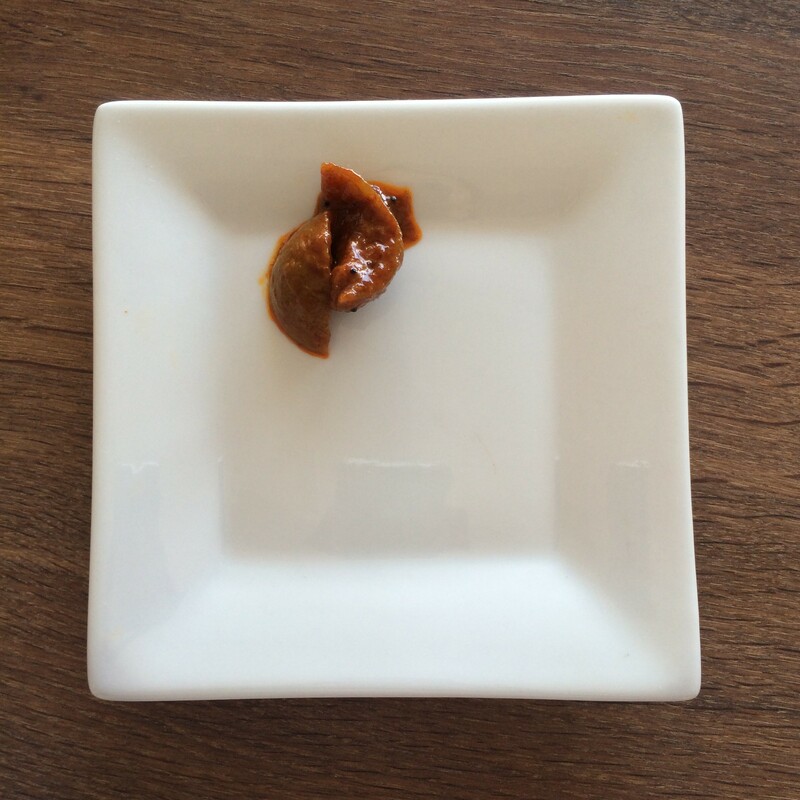 I like to use regular water and throw in half a bouillon cube. Bring the broth to a boil and then reduce heat, cover partially and simmer for 20 minutes. Check on the soup at 20 minutes and add salt, pepper and cayenne to taste. Cook another 10 minutes as needed with the cover removed. Let your soup cool before getting your immersion blender out and working through it. 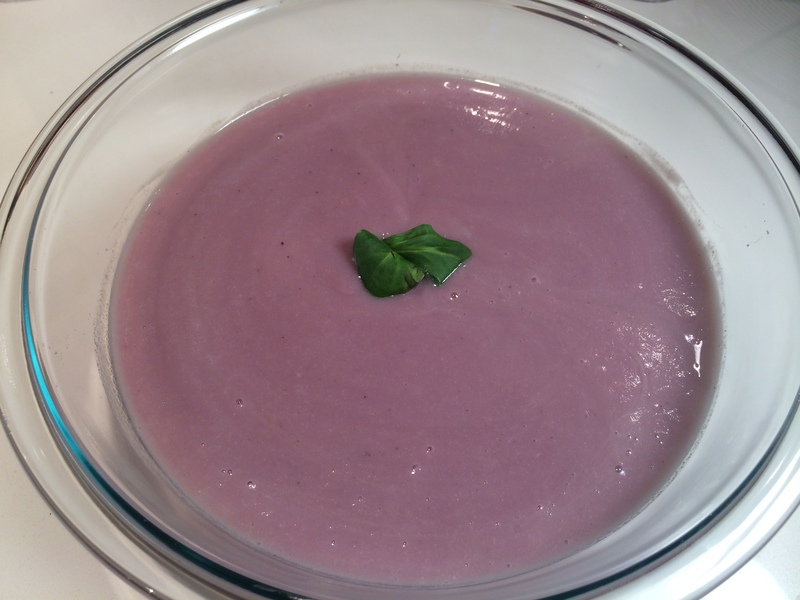 If you don’t have an immersion blender you can use a regular mixer or magic bullet and handle the soup in batches. Transfer to a large bowl and garnish with with whatever you like.